WHAT: With the arrival of the hurricane season, the University of Maryland is offering reporters the chance to experience first-hand what hurricane winds really feel like at the Glenn L. Martin Wind Tunnel Media Day on Friday, June 12 on the College Parkcampus. Members of the media will have the opportunity to stand in the wind tunnel and face category three winds -- up to 115 mph! University of Maryland faculty and scientists will be on hand to answer media questions about disaster resilience, weather, wind and the wind tunnel. For example, researchers from the university's Center for Disaster Resilience will be available to shed light on why many communities need to ramp up resilience measures despite this year's forecast of a below normal number of storms this year. The NOAA 2015 hurricane season outlook release noted that below-normal seasons can still produce catastrophic storms, noting the 1992 season produced only seven named storms, but one was Andrew -- a Category 5 Major Hurricane that devastated South Florida. 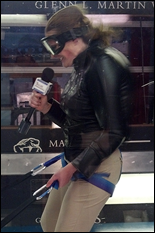 The university provides members of the media access to the wind tunnel just once a year. Media must book an appointment (up to one hour's time) by calling or emailing Lee Tune at 301-405-4679 or ltune@umd.edu. This may be your only chance to get into the wind tunnel before another Atlantic hurricane season. The Glenn L. Martin Wind Tunnel, a part of the University of Maryland's A. James Clark School of Engineering, is one of the busiest wind tunnels in the country and is booked months in advance for research activity. WHO: Disaster resilience, weather, wind and wind tunnel experts, as well as scientists who can talk about tornadoes and hurricanes will be on hand to answer media questions. WHEN: Friday, June 12 from 8 a.m. to 5 p.m. by appointment only. HOW: To book a time slot, contact Lee Tune at 301-405-4679 or ltune@umd.edu or the main office number, 301-405-4621. FOR ATTENDEES: Due to the potential wind velocities experienced in the tunnel, visitors are strongly advised to wear durable, rubber soled shoes and snug, securely fastened clothing. The Wind Tunnel building is located on Paint Branch Drive near the intersection of Campus Drive and Paint Branch Drive. Bldg. #081 on the University of Maryland campus map, http://www.transportation.umd.edu/parking/maps/map_campus.pdf. Media should park in the metered Paint Branch Visitor Lot. For more information about how Center for Disaster Resilience researchers are working to help communities build resilience this hurricane season, visit http://ter.ps/resilience.